The annual rate of inflation, based on monthly Wholesale Price Inflation (WPI), stood at 3.58 percent (provisional) for the month of December 2017 as compared to 3.93 percent for the previous month. Build up inflation rate in the financial year so far was 2.21 percent compared to a build-up rate of 3.71 percent in the corresponding period of the previous year. The index for this major group declined by 2.9 percent to 131.7 (provisional) from 135.6 (provisional) for the previous month. The groups and items which showed variations during the month. The index for 'Food Articles' group declined by 4.3 percent to 144.1 (provisional) from 150.6 (provisional) for the previous month due to lower price of fruits and vegetables (14 percent), peas/chawali (6 percent), gram and egg (5 percent each), rajma and poultry chicken (4 percent each), coffee and fish-inland (3 percent each), urad and tea (2 percent each) and maize and masur (1 percent each). 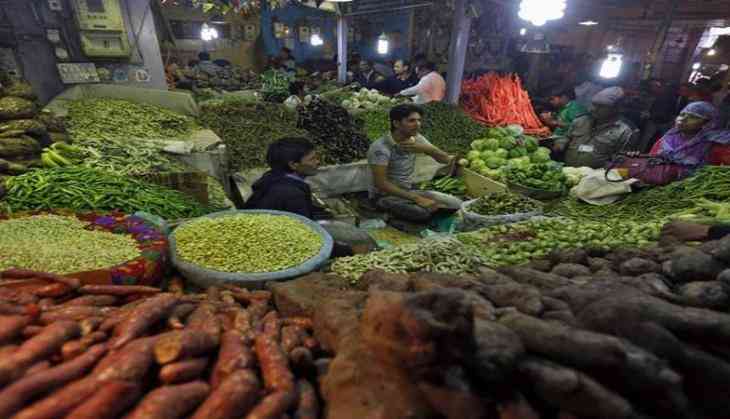 However, the price of betel leaves (16 percent), bajra (3 percent), jowar, barley and condiments and spices (2 percent each) and arhar, moong and pork (1 percent each) moved up. The index for manufactured products rose by 0.1 percent to 114.0 (provisional) from 113.9 (provisional) for the previous month. The groups and items which showed variations during the month. The index for 'Manufacture of Food Products' group declined by 0.4 percent to 127.4 (provisional) from 127.9 (provisional) for the previous month due to lower price of molasses (20 percent), gur and gram powder (besan) (6 percent each), sugar, honey and powder milk (4 percent each), coffee powder with chicory and bagasse (3 percent each), processed tea, maida and sooji (rawa) (2 percent each) and chicken/duck, dressed-fresh/frozen, basmati rice and instant coffee (1 percent each). However, the price of processing and preserving of fish, crustaceans and mollusks and products thereof, copra oil and other meats, preserved/processed (4 percent each), manufacture of macaroni, noodles, couscous & similar farinaceous products (3 percent), cotton seed oil, wheat bran, spices (including mixed spices) and buffalo meat, fresh/frozen (2 percent each) and mustard oil, sunflower oil, rice bran oil, groundnut oil, castor oil, ortland, palm oil, rice (non-basmati), manufacture of cocoa, chocolate and sugar confectionery and processing and preserving of fruit and vegetables (1 percent each) moved up. The rate of inflation based on WPI Food Index consisting of 'Food Articles' from Primary Articles group and 'Food Product' from Manufactured Products group decreased from 4.10 percent in November 2017 to 2.91 percent in December, 2017.